This is “Pulse, Tempo, and Meter”, section 1.2 from the book Music Theory (v. 1.0). For details on it (including licensing), click here. Definitions of the elements of rhythmic organization. Perception of Tempo and commonly used terms. Mapping out meter (time signatures): the perception of Simple and Compound Time. How these elements interact in music. Pulse—“beat”: the background “heartbeat” of a piece of music. Tempo—“rate”: the relatively fast or slow speed at which we perceive the pulse in a piece of music. Meter—“ratio”: how durational values are assigned to represent the pulse are organized in discrete segments in a piece of music. PulsePulse (or beat) is the regularly recurring background pulsation in music., or beat, is the regularly recurring underlying pulsation that we perceive that compels music to progress through time. Pulse makes us react kinesthetically to music: in other words, it compels motion. We tap our feet, we dance, we march, or we may just “feel” the pulse internally. In a piece of music, some durational value is assigned to be the pulse. All other durations are proportionally related to that fundamental background pulse. Around the 17th Century (roughly! ), Italian terms came to be used to indicate tempo. These terms were descriptive and therefore rather loosely interpreted as to exact tempo. These terms indicate a narrow “range” of metronomic speeds. For example, the term Andante means “going” or “a walking tempo.” This usually equates to roughly 76 beats per minute, but may be interpreted at a slightly faster or slightly slower pace. In an attempt to refine these terms, to make them more precise, diminutives were added: Andantino indicates a slightly faster pace than Andante. Other modifiers came into common practice as well. For example, Andante con moto (“going, with motion”) is self-explanatory. Beginning in the 19th Century, composers often used equivalent tempo and performance descriptions in their native languages, or mixed Italianate terms and vernacular terms within the same piece. It is important to understand that the use of these terms exceeded mere indications of relative speed. Often, they also carry the connotation of style or performance practice. For example, Allegro con brio (“lively, with fire or brilliance”) implies a stylistic manner of performance, not merely a rate at which the pulse progresses through time. Chapter 19 "Appendix A: Common Musical Terms" lists common terms and their commonly accepted meanings along with some equivalents in other languages. The relative strength of pulses (perceived accents) within segments or groupings of pulses.Concerning accentuation of pulse, you will encounter the terms Arsis and Thesis, terms adapted from Hellenistic poetic meter. These have come to mean “upbeat” and “downbeat” respectively. These are nearly slang definitions or, at best, jargon. Arsis is best described as “preparatory,” hence perceived as a relatively weak pulse. Thesis is best described as “accentuated,” hence relatively strong. It is interesting to note that, at various times in the history of music, the meaning of these two terms has been reversed from time to time. Time signaturesMeter is expressed as time signatures, indicating how many pulses (beats) are grouped together into cogent units. consist of two numbers, one over another, placed at the beginning of a composition. They may occur anywhere in a composition where a meter change is required. They are NEVER written as fractions! The prevailing background pulse may be subdivided into two proportionally equal portions. Meters having this attribute are labeled Simple Meter (or Simple time). The prevailing background pulse may be subdivided into three proportionally equal portions. Meters having this attribute are labeled Compound Meter (Compound time). Is it Simple or Compound time? How many prevailing background pulses are grouped together? So, a time signature wherein (a) the pulse subdivides into two portions, and (b) two pulses are grouped together is called Simple Duple. Three pulses grouped together, Simple Triple and so forth. A time signature wherein (a) the pulse subdivides into three portions, and (b) two pulses are grouped together is called Compound Duple, three pulses, Compound Triple, and so forth. For the top number: “How many…?” In other words, how many prevailing background pulse values (or their relative equivalent values and/or rests) are grouped together? For the bottom number: “…of what kind?” In other words, what durational value has been assigned to represent the prevailing background pulse? So the time signature 24 has two quarter-notes grouped together, therefore, we label this as Simple Duple. In Renaissance music, specialized symbols were employed that were the forerunner of time signatures. These symbols determined how relative durational values were held in proportion to one another. We continue to employ two holdovers from this system. “Common Time” and “Cut Time,” are slang terms. Other names for “Cut Time” are “March Time” and the proper name, Alla Breve. The prevailing background Pulse or beat. First Division: the level wherein we determine if the pulse divides into two equal portions (simple meter) or three equal portions (compound meter). Subdivisions: how First Division values subdivide into proportionally smaller values. Therefore, we can graph time signatures using the following table. Use this table to map out time signatures and their component organizational layers. The upper number is 3 or a multiple of 3. The prevailing background pulse must be a dotted value: remember, in compound meter, the pulse must have the capacity to divide into three equal portions. Subdivisions of the background pulse are usually grouped in sets of three by the use of beams (ligatures). If a tempo is slow enough, any compound time signature may be perceived as a simple meter. In practice, this is limited by style and context in compositions. In order to find the pulse value in compound time signatures, use the Time Signature Table. List First Division values (the written time signature) in groupings of three. Sum these to the dotted value representing Pulse. List these accordingly in the Table. Below are typical compound meters and their respective labels. Note that Simple meters divide all values into two subdivisions in each level of the Table. Compound meters divide the First Division level into three (see Statement 1 above). Subsequent subdivisions divide into two. may be perceived as Simple Triple if the tempo is relatively slow. In other words, you perceive the “lower number” of the time signature as the fundamental background pulse value. As the tempo for any of these becomes relatively faster, we cease to perceive the lower number as Pulse. Instead we perceive the lower number as the First Division of a Compound meter. In the next section, these fundamental elements of sound, symbol, and time will be placed in full musical context by uniting them with common notational practices. Pulse (“beat”), Tempo (“rate”), and Meter (“ratio”). Simple Meter: recognizing and analyzing Simple Time Signatures. Compound Meter: recognizing and analyzing Compound Time Signatures. Time Signatures that may be perceived as either Simple or Compound and why they are so perceived. Using the Time Signature Table as a tool for graphing Time Signatures. Simple Duple and Compound Duple. Simple Triple and Compound Triple. Simple Quadruple and Compound Quadruple. Note: At the Subdivision level, draw one layer of subdivisions only. In class (or some group), practice tapping a slow beat with your left foot. Against that beat tap two equal (“even”) divisions with your right hand (simple division). Next, keeping that same slow beat in your left foot, practice tapping three equal (“even”) divisions with your right hand (compound division). Lastly, switch hands and feet. Good luck. The following exercises alternate between simple duple and compound duple. 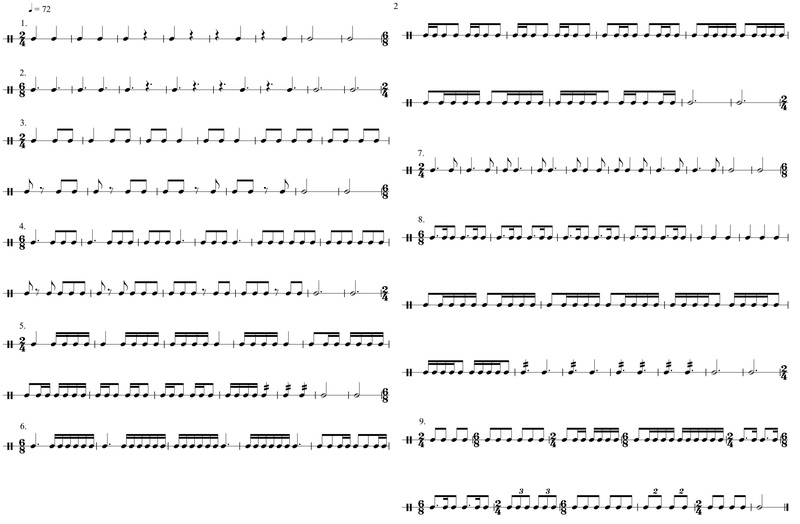 Tap these rhythms while keeping the same constant background pulse. Practice each segment separately at first: then practice in sequence, switching from simple to compound time as you go.